On behalf of the left group in the Council of Europe, Mr. Kox asked the European Human Rights Commissioner Dunja Mijatovic to look urgently at the situation of journalist and WikiLeaks founder Julian Assange, who was arrested in London yesterday. The United States has asked for its delivery because thousands of secret messages have come out via WikiLeaks about, among other things, illegal American military action. 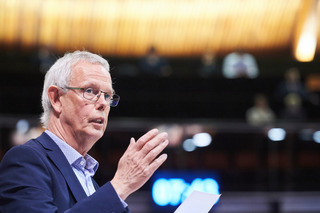 The Human Rights Commissioner was at the Parliamentary Assembly in Strasbourg this week and spoke about the greatest human rights threats in member states of the Council of Europe. One of them, she said, was the protection of journalists. This is mentioned in Article 10 of the European Convention on Human Rights (ECHR) as a fundamental right. Therefore, the UEL chairman asked whether she wants to ascertain whether the arrest of Assange by the British police is compatible with the ECHR, and whether extradition of Assange to the US – where he is regarded as a kind of state enemy – is admissible, given the ECHR. Mr. Kox also asked if, in the case that Mr. Assange appeals to the Convention at the European Human Rights Court, he may be extradited to the US in the meantime or not.